The Abbey was established in 1147 by Eustace Fitz-John for 21 canons of the Premonstratensian Order, which was founded by St Norbert in France in 1119. It once held two major relics: the chalice of Thomas of Canterbury and the toe of Simon de Montfort. 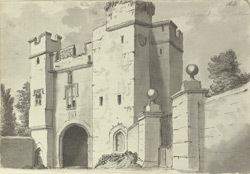 By the 18th century the only building left standing was this 15th-century square-turreted and crenellated gatehouse decorated with the arms of Alnwick Abbey.